Sometimes I catch myself dreaming that I’m at the controls of the mighty Keck telescope up at the summit of Mauna Kea on the Big Island of Hawaii. I fancy myself peering through its 10-meter aperture at some distant deep sky object feeling at one with the universe. I invariably fall back to reality though as I remember that a night of observing with the Keck runs about $475,000 – a bit outside of my budget. But what if the reality was that I could rent time on a top-notch telescope with a high quality CCD camera – all from the comfort of home? This is not fiction. This is real with the advent of some exciting new web-based observatories. Pick from one of several new providers - Slooh, LightBuckets, and Global Rent-A-Scope, and you can take control of some pretty impressive astronomical equipment, all from your computer’s web browser. For the most part, these observatories are operated by small businesses owned by an astronomy enthusiast that wanted to bring professional astronomical equipment to the masses. Each company maintains multiple observatories located around the world, and each observatory has a variety of high-end telescopes. Slooh has four observatories. Two are in the Canary Islands, one is in Chile, and one is in southern Australia. Both LightBuckets and Global Rent-A-Scope (GRAS) have two locations, one in New Mexico and another in Australia. All the vendors have nicely evolved web software interfaces to facilitate the remote observing experience. I would say, however, that the Slooh web interface is by far the most stylish and approachable to the widest audience including young people. The equipment maintained by these providers is impressive. The largest LightBuckets instrument currently online is a RCOS 24-inch f/8 Ritchey-Chretien reflector fitted with a large format CCD camera. Slooh telescopes range from a 77-mm apochromatic refractor for wide-field imaging to a 20-inch Dall-Kirkham Cassegrain for deep-sky work. The GRAS scopes range from 16-inch Ritchey-Chreitien and 12-inch Dall-Kirkham reflectors to 4.2-inch refractors for wide-field imaging. The approximate cost for access to a 12 to 15-inch telescope is - $50/year for Slooh, $35/hour for LightBuckets, and $37/hour for GRAS. All you need to do is register and pay-up in order to start observing. Whether you are a beginner, a seasoned astrophotographer, a science teacher, or a researcher, there is an open telescope solution to meet your needs. It is great for people like me who live in light polluted areas. It also makes southern hemisphere observing a reality without hopping a long flight down under. 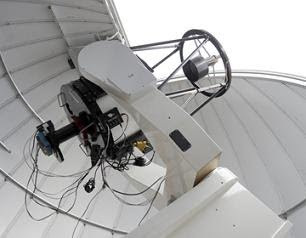 This concept is destined to make remote observing using top-notch instruments commonplace. Maybe one day I’ll actually get a slice of time on the Keck or similar telescope for a reasonable fee, but until then, any one of these web-based observatories will do just fine! THANK YOU! i had no idea such a service existed. wow this is great. i'm going to have to choose one.